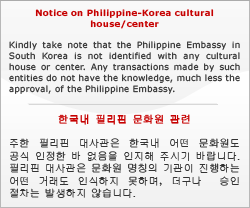 SEOUL, 31 March 2019 - The Philippine Embassy in Seoul, in celebration of National Women's Month and as part of its Gender and Development efforts to advance women empowerment, organized a forum and a painting exhibition at the Embassy for over 60 female members of the Filipino community in South Korea. 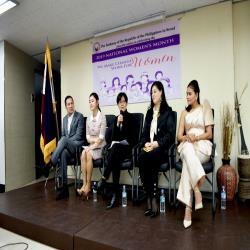 Ambassador Raul S. Hernandez (leftmost) with guest speakers, Ms. Youngha Go (2nd from left), Ms. Kim Hooran (middle), Ms. Susan MacDonald (2nd from right), and Madame Maria Ana A. Hernandez (rightmost) during the Women�?s Month Forum organized by the Embassy for some 60 Filipino female community leaders in South Korea. The event featured four guest speakers: Ms. Young Ha Go, CEO of AMC Asia and AHAVA Korea; Ms. Hooran Kim, general news section editor at The Korea Herald, the largest English-language daily published in Seoul; Ms. Susan MacDonald, the first-ever female executive and Director of the Market Intelligence Team at SYS Global, an affiliate company of ET Land, one of the largest consumer retail/online electronics companies and private conglomerates in South Korea; and Madame Ana A. Hernandez, author of the books "Binibining Stewardess: Mga Kuwento ng Flight Attendant at Iba Pa" and "Welcome Aboard! The Ultimate Flight Attendant Guide for a Successful Sky -high Career," and the spouse of Philippine Ambassador to South Korea Raul S. Hernandez. Under the overarching theme, "We Make Change Work for Women," the forum was devoted to celebrating and promoting women empowerment and the greater participation of female leaders in the Korean community. The discussions centered on the role of women in galvanizing change in an otherwise traditionally male-dominated society. The guest speakers also candidly shared their personal experiences on balancing family life and career and offered insights on how Filipinas in South Korea can bring about positive change through meaningful engagements. Ambassador Hernandez, in his opening remarks, highlighted the great strides which the Philippines has made in recent years in terms of narrowing gender gaps, as supported by data from the World Economic Forum's Global Gender Gap Report in 2018 where the Philippines ranked 8th out of 149 countries surveyed. After the 2-hour forum, the guests witnessed the opening of the Embassy's National Women's Month Painting Exhibition. The exhibition featured artworks of Madame Ana Hernandez, Attache Cheryl Navarro, and FilCom member Mr. Michael Popatco. A total of 26 pieces depicting the influence of women in today's society were put on display. The participants of the event were treated to a musical performance by MERJ, a local singing group that performs at the Grand Hyatt Hotel in Seoul, as well Filipino fare such as pansit palabok, maja blanca, and puto.